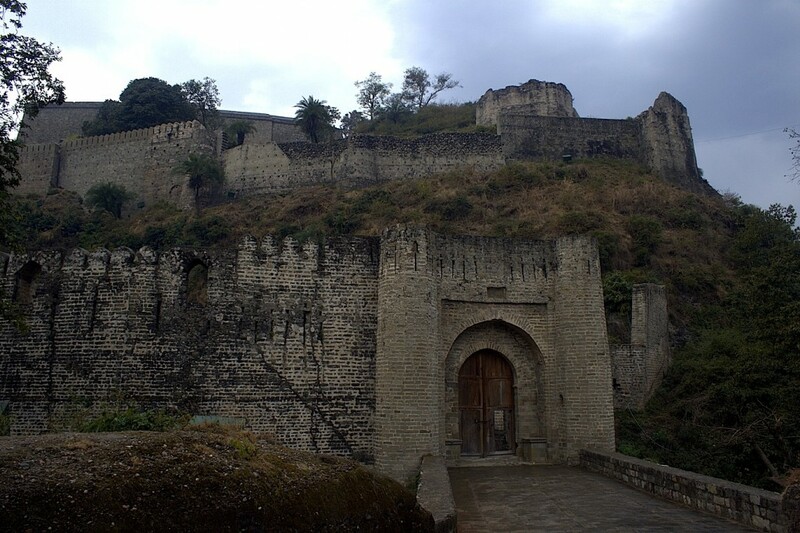 The Fort, occupying a long strip of land is enclosed with high rampart and the walls cover a circuit of about four kilometres. The main entrance gate is called the Ranjit Singh Gate which is followed by a narrow path leading to Jahangir gate, through the Ahani and Amiri Darwaza, both attributed to Nawab Alif Khan, the first Mughal Governor of Kangra. Thereafter is the Andheri Darwaza from where the path is forked into two directions. The path to the left, through Darsani Darwaza, leads to the portion containing the Laxminarayan temple, datable to Circa ninth-tenth century AD and shrines of Sitala and Ambika Devi. To the north between the two last mentioned buildings is a staircase led up to the palace, known as Shish Mahal and further beyond to the south-west is the polygonal watch tower overlooking the valley. The other path leads to the portion containing the mihrab of a mosque built in Jahangir's time, the Kapoor Sagar tank and other structures. 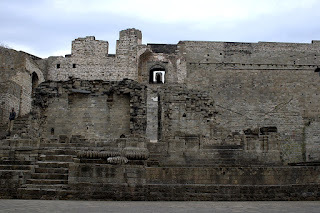 The most valuable monuments in the Kangra Fort are the so-called temples of Laxminarayan and Sitala, two square chambers profusely decorated with carvings. The ceilings of the Laxminarayan temple is remarkable for its elaborate decoration: The destruction of these two temples is due to earthquake and is perhaps great loss of an irreparable nature. The temple of Ambika Devi, still used for worship is much plainer structure evidently of no great age. The only ancient portion seams to be the pillars and architraves of the mandapa covered by a flat dome. To the south of the Ambika Devi temple are two small Jaina shrines facing west, one of them contains a plain pedestal and in the other is placed a seated image of Adinath, with partly obliterated inscription dated Samvat 1523 i.e.AD 1466 in the reign of Katoch Raja, Sansar Chand I. The clearance and conservation work brought to light number of loose sculptures and architectural members of the monument which have been kept in a sculpture shed. The important ones, six in numbers have been exhibited in the Himachal State Museum, Shimla. There is a proposal to exhibit the remaining loose sculptures and architectural members by renovating and reconditioning the' existing portions of the monument.